A first hit is over passed towards the net and passes partially through the plane of the net. The back row setter is tall and jumps to pull the ball back with a closed fist. Is this a legal hit? Or does the moment the ball touches the plane mean that the back row setter makes an illegal attack on the ball even though he is pulling the ball back for a third hit? This is the ball position where the back row setter makes contact. Whether the hit itself was legal: Did the setter touch the ball within his own playing space? Was it a proper hit? (Was the ball not held/caught/thrown)? According to your image, the setter touched the ball beyond the net, above the opponent’s court. In that case, the setter made a fault of “reaching beyond the net”, signalled by the referee by a hand placed above the net, palm facing downwards. 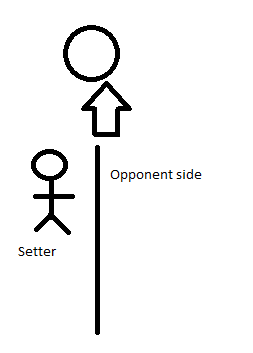 When the set is imperfect and the setter actually plays the ball towards the opponent’s court, it counts as an attack hit. And back-row players cannot complete an attack hit from the front zone when the ball is completely above the top of the net. This means that if the setter hits the ball completely above the top of the net towards the opponent’s court, it is an “attack hit fault” if the attack hit is completed, which means either the ball crosses the vertical plane of the net completely, or the opponent touches the ball. But if the back-row setter touches the ball within his own playing area (or, theoretically, above the free zone, if the ball is overflying the net partially or completely outside the antennae), and plays it “backwards” into his own half of the court or parallel to the net or his teammate touches the ball prior to the ball crossing the net completely and prior to any blocking opponent touching the ball, it is valid play. 11.4.1 [Player’s faults at the net] A player touches the ball or an opponent in the opponent's space before or during the opponent’s attack hit. 13.1.3: An attack hit is completed at the moment the ball completely crosses the vertical plane of the net or is touched by an opponent. 13.2.3: A back-row player may also complete an attack hit from the front zone, if at the moment of the contact a part of the ball is lower than the top of the net. 13.3.3: [Faults of the attack hit] A back-row player completes an attack hit from the front zone, if at the moment of the hit the ball is entirely higher than the top of the net. Team A’s setter hit the ball above the net so that at the moment of the hit his/her fingers were in the opponent’s space. After the set the ball flew parallel to the net toward an attacker. The blocker of team B touched the ball in team’s A space, so that the team A player could not execute the attack hit. How should the 1st referee decide? According to Rule 9, each team must play the ball within its own playing area and space (except in the case of Rule 10.1.2). Therefore, since the setter has hit the ball in the opponent’s space, the setter committed a fault. The blocker also committed a fault by touching the ball in the opponent’s space before the attack hit. However, only the first fault is penalized. A back row setter jumped from within the attack zone and set the ball while it was completely above the height of the net, directing it towards an attacker. Before the attacker could contact the ball, it penetrated the vertical plane of the net where it was blocked by the opponent’s setter. Was there a fault? Yes. The set became an illegal attack hit by a back row player when the attack hit was completed (in this case by contacting the opponent’s block). The rally should have been won by the opponents. i.e. any contact with the ball must be made while the ball is still on that team's side of the net: if the part of the ball which was touched was entirely on the receiving team's side of the net, then it is a legal touch. Conversely, if the part of the ball that was touched is on the opponent's side of the court, it is a fault. All that applies equally to front and back row players. (As you're aware, a front row player could attempt an attack hit on the ball. Of course, if a back row player attempted an attack hit on the ball while it was above the height of the net, that would also be a fault). Can we use a leg to play the ball in volleyball? Can an intercepting player be down by contact that occurs before the interception? Can a back row player joust at the net without jumping? Can a force play come back into effect if a runner reaches the required base but then retreats?